Many thanks to Stephen for donating this to the magazine collection! Almost seven years after quitting the band, Red Hot Chili Pepper John Frusciante is back in the fold. Total Guitar charts the ups and downs of the funk-loving band, and talks exclusively to the guitarist about the latest album, Californication. By Mark Ramshaw. Interview by Ronaldo. Few bands have been depicted as two-dimensionaly as the Red Hot Chili Peppers. It’s understandable given the larger than life attitudes, tattoos and muscles image, and the infamous era when the only clothing worn on stage was one single sock per (ahem) member. Yet the Chilis are far from easy to pin down, their music anything but conventional, and their history so turbulent it’s actually surprising they still exist at all. 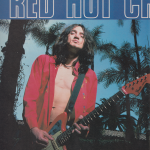 Californication marks guitarist John Frusciante’s return, and is the band’s most substantial record yet. Musical and lyrical depth, close harmonies and some spectacular funk-rooted guitar playing make it one of the most energetic and essential albums of the last five years. Although not the original Red Hot Chili Peppers six stringer, it’s Frusciante’s playing that most readily identify with, his idiosyncratic style stamping hits such as Give It Away, Knock Me Down and recent ’45 release Scar Tissue with rare subtlety and raw soul. Small wonder that fans of the band have been so ecstatic about his return. Fairfax High School in Los Angeles provided the meeting place for four culturally diverse teens, Anthony Kiedis, the Michigan born son of actor Blackie Dammet, Australian Michael Balzary (AKA Flea), Californian Jack Irons and Israeli Hillel Slovak. Singer Kiedis and bassist Flea first played as Los Faces as far back as 1978, before recruiting guitarist Slovak and drummer Irons for a first (one song) gigl under the name Tony Flow And The Miraclously Majestic Masters Of Mayhem. By 1983 they were known as Red Hot Chili Peppers (the name taken by combining the names of two popular bars), and signed up to EMI. At the time Irons and Slovak were moonlighting in the band What Is This?, a move that made it impossible for them to play on the self-titled debut album. Guitarist Jack Sherman and drummer Cliff Martinez were recruited, though by the time recording of the second album began with legendary George Clinton in the producer’s chair, the original foursome were back together. Freaky Styley reflected the funk ‘n’ punk stew beloved of the band rather better than the debut, but it wasn’t until the arrival of third album The Uplift Mofo Party Plan in 1987 that the Red Hot Chili Peppers really found their footing, ushering in a brand new era of alternative American music, alongside bands as diverse as Jane’s Addiction, Fugazi and Fishbone. It was also the beginning of the end for the original line-up. On June 27th of the following year, Slovak, a long-time heroin user, fatally overdosed. It proved too much for Irons, who quit (more recently resurfacing in Pearl Jam), to be replaced by current stickman Chad Smith. 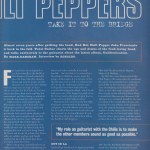 Soldiering on, Kiedis and Flea had some trouble finding the right guitarist – Clinton Cohort and Parliament veteran Blackbyrd McKnight even joined for a while – until John Frusciante came into the picture. A teenage fan of the band and gifted guitarist, he’d already met them and spoken to Slovak several times, and could play the parts to the whole Chilis catalogue. Some even commented that he acted, as well as played, like Slovak. Despite being a mere 18 years old, he was obviously perfect for the role. 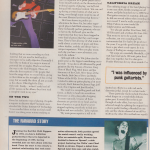 1989’s Mother’s Milk saw Frusciante build on the band’s familiar style, mixing up rock, funk and soul in equal numbers, as typified by the infectious cover of Stevie Wonder’s Higher Ground and ode to Hillel Knock Me Down. It also brought the band that bit closer to mainstream acceptance, thought it was to be the Rick Rubin produced BloodSugarSexMagik (released in 1992) that propelled them into the stadium league. 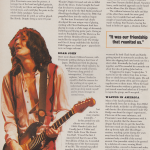 By this time Frusciante had clearly developed his own unique way of playing, working with Flea’s flamboyant funk bass playing to create a whole range of alternately stuttering and flowing guitar parts. 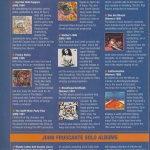 Owing as much to Funkadelic and The Meters as the more obvious Hendrix reference points, tracks like the mega-hit Under The Bridge and Give It Away established the Red Hot Chili Peppers as a band apart – pigeonholes were no longer relevant. In this period, two solo albums were released, 1994’s Niandra LaDes And Usually Just A T-Shirt and 1997’s Smile From The Streets You Hold. 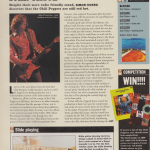 “I loved the first, I sincerely feel that it’s one of the best albums of that era. I recorded it during one of the best moments of my life. The second was pulled together from half-finished recordings. Some bits aren’t in fact any more than demos recorded on a four-track. I did it just because I needed the money and was really in a bad state. Today I hate it, I’ve got four copies at my house and I won’t even lend them to my best friends. To me it’s not an album, because it’s just some odds and ends of songs thrown together. Meanwhile the Chilis’ search for a new guitarist began afresh, with Arik Marshall and Jesse Tobias proving ill-suited replacements, before ex-Jane’s Addiction man Dave Navarro climbed aboard. Navarro’s heavy, multi-tracked approach can be heard on the album One Hot Minute (1995). The collision between his style and that of the other three made for some good music, but it couldn’t last and within a couple of years both parties admitted it wasn’t working. Exit Navarro, leaving the band in limbo yet again, a situation further worsened by both Chad Smith and Kiedis getting injured in motorcycle accidents, the latter also slipping back into heroin use for a short while. Eventually the band pulled together, and Flea sounded his comrades out about the idea of getting John back in. Many of the band’s problems have undoubtedly been due to drugs, from Hillel Slovak’s death to Kiedis’ on-off relationship with heroin (the aforementioned Under The Bridge was about the singer’s experiences), Flea’s use of the same substance, and Frusciante’s near-death experiences with it. It’s even possible that the descent into despair that led him to quit the band the first time are drug-related. He first shot up heroin right after BloodSugar… sessions, reaching a point during the years away from the band where his body contained only a twelfth of the normal amount. One journalist visited to be greeted by a skeleton of a man, wearing blood-stained clothes, covered in bruises and scabs, and subsisting on liquid supplements rather than facing real food. Yet even then he described his decision to become a junkie as a way of escaping the depression, and maximising his creativity. Now clean, his view is similarly honest. “I feel so privileged to be able to use an instrument of expression like the guitar and to be able to say on it almost everything that I want. I could never just paint a blue sky or reach a direct emotion as I am always striving to do on my guitar. To give up the study of those great painters, I had to realise what an incredible work discipline they followed, and that I would try to do the same on my own level with music. 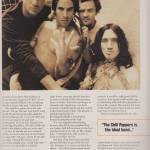 Reconvening in the spring of ’98, the four Chili Peppers wasted no time writing new material. Jamming and writing in Flea’s garage over the summer, they emerged with almost 40 tracks – a stark contrast the protracted time it took to create One Hot Minute. When it came to selecting a producer, they opted to find a fresh ear, asking – and getting turned down by around five names, including Flood and even David Bowie – before finally approaching Rick Rubin to work with them for a third time. It undoubtedly proved the right choice, his spartan production style once again bringing the best out in the music. He also developed an obsession with harmonies late in the day, getting Frusciante to stay behind in the studio to record multiple backing tracks, the results lending the finished tracks a whole new dimension. John clearly relished working with him again. The result is a compelling punk and funk fusion, as likely to head into overdriven dissonance as ultra-danceable chopping. “It comes naturally, because all those elements are present in my head, and my love of music is so great that I’ve never stopped exploring ceaselessly to find new rhythms and new melodies,” John explains. Those particular tracks include Porcelain, which hinges on a wonderfully delicate guitar part. It sounds like it’s been put through a Leslie effect, but was in fact achieved simply by splitting he output from a chorus pedal, feeding a Marshall on one side and the vibrato channel of an old Vox AC30 on the other. His methods are equally economical elsewhere. The feedback on Emit Remmus suggested an E-Bow. “No, it was just natural feedback, with me playing directly in front of the amp,” admits John. The Red Hot Chili Peppers have been at the stage before, of course. Right now all four are optimistic about their relationship, their new album, and the future of the band. But while it will be all too easy for something else to go wrong, for heroin to pull one of the band members back down, or sheer bad luck to rear its ugly head yet again, there’s every sign that the foursome are more comfortable about their position than ever before. Frusciante rejoining was obviously such a good move, one that’s renewed everybody’s spirits and has resulted in their finest music to date. The guitarist, so jaded during the days of BloodSugarSexMagik is even looking forward to going out on the road.